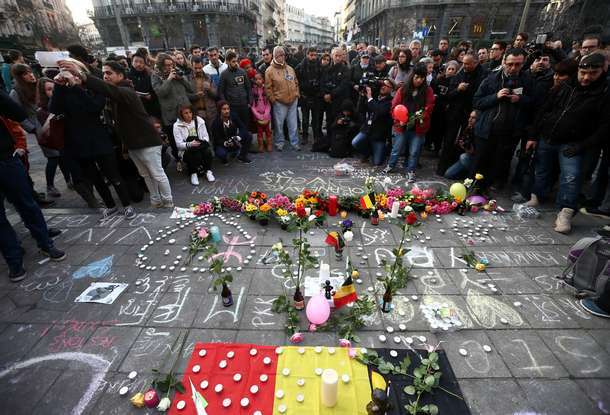 A memorial in Brussels for victims of March 22 terrorist attacks. This joke is Woody Allen’s introduction to his masterpiece Annie Hall. It was featured last month in New York Magazine as one of the 100 jokes that shaped modern comedy. It’s noteworthy that no fewer than 50 out of the 100 top jokes were written or performed by Jews, including Woody Allen. The selection I shared, emblematic of Allen’s signature neurosis, is very Jewish. The Jewish psyche tempers joy with sorrow and counters sorrow with hope and yearning for life. Our celebration of Purim has passed, we are still in the month of Adar about which the Talmud says mi-shenichnas Adar marbim b’simcha, whoever enters Adar increases joy. Purim may be a joyous holiday, yet the scroll of Esther is tinged with our genuine fear of massive harm to the Jewish people. Our history since the time of the Megillah has reaffirmed far too many times the genuine sense of fear in the Megillah story. At the same time, the Esther story reminds us that out of the fear came redemption. We need not despair, the Megillah urges us. This week underscored the profound challenge in our tradition in balancing joy and sorrow, hope and fear. Once again acts of terror reminded us of the existence of evil in this world. More than 30 people were murdered, and more than 250 injured in a senseless act of terror in Brussels. ISIS launched this attack on the heels of another vicious attack in Istanbul last weekend in which three Israelis were killed, two of whom were also American citizens. Thirty-six people were injured, including 11 Israelis. Tragically, amidst the volatile situation in Brussels in which police are on high alert, the Jewish community there cancelled Purim serices at all synagogues. Rabbi Danny Nevins describes Purim as either a joyous sorrow or a saddened joy —neither a tragedy nor a clean escape. As it happens, we find ourselves at a point in the Torah reading cycle that reinforces this theme. This week’s Torah reading, Parashat Tzav, describes a seven-day ordination ceremony for Aaron and his sons as the priests of Israel. Next week, we will read about the eighth day in which the ordination is completed, to be followed immediately by the tragic death of Aaron’s sons Nadav and Avihu. The number seven is symbolic for both joy and sorrow. Seven days are dedicated to celebrate a marriage, and seven to mourn a death. In both cases, seven days are dedicated to a transition of a new phase of life. Amidst these transitions, we temper our emotions. We temper the joy of the wedding with the breaking of a glass, recalling pain and sadness in our history; we offer comfort to the mourner during the shiva period, providing hope and reassurance that life will continue and that the mourner is not alone. As Rabbi Nevins teaches, the Talmud in Megillah 10b notes that the introduction ויהי, “and then it happened…” always anticipates disaster. This is the opening word of Megillah Esther—“And it happened in the days of Ahashverosh”–and also of next week’s portion, Shmini—“And it happened on the eighth day” (Lev. 9:1). Both texts do indeed include disasters. Indeed, these texts have their share of pain and suffering. One the other hand, both texts have celebration as well. The Megillah story ends in redemption. Meanwhile, the ordination of the kohanim in the Tabernacle paralleled the creation of the world in seven days. According to the Talmud, the day the Tabernacle was dedicated was God’s happiest day since creation. The period between Purim and Pesah is in a sense the happiest time of year for the Jewish people. We connect one redemption to the other, setting aside historical chronology for the deeper cycle of crisis, loss, rebuilding, celebration and anticipation of the next calamity. Even as Aaron and his sons sit in dedication, filled with joy over their selection to serve God as priests, they are likewise observing an advance shiva, an anticipated loss which is as yet unknown to them. Even with such a fatalistic reading of the text, Aaron and sons were not deterred from affirming life and carrying on with their dedication. The message of the Jewish calendar at this moment is that in the midst of our celebrations, our joy is tempered by the pain and suffering in the world around us, especially at the hands of evil terrorists. At the same time, even in a week like the one just passed in which we have witnessed horrific violence and bloodshed, we must affirm life. Purim is over, and Pesah is around the corner. Let us appreciate the true value of this season of redemption so that in spite of the fear and vulnerability that we feel, we will resolve to carry on our lives with confidence and joy.